So with Valentine’s Day right around the corner, I am in a pink mood. To be honest with you, pink is really not normally my color. Though it certainly is for my nine year old daughter who has her room covered in pink from floor to ceiling. But for me, it is not really a staple in my wardrobe or decorating palette. So besides subbing out the mint chips for mini-chocolate chips, I also knew I wanted to slather these cookies with pink frosting. Not just any pink frosting but strawberry buttercream frosting! Oh my heavens!! This frosting is SO delicious! Can you see those red flecks in the frosting? Those are real strawberries. And it makes this frosting taste out of this world delicious! Seriously. What could be more Valentine-y than chocolate and strawberries?? And when the chocolate is in a rich soft cookie, and the strawberries are in a fluffy delicious frosting, this is Valentine heaven!! Pre heat oven to 350 degrees. Cream the butter and sugars in a large mixing bowl. Beat in eggs and vanilla, mixing until incorporated. In a medium bowl, strain together flour, cocoa, baking soda and salt. Place flour mixture, melted chocolate and milk alternately in the mixing bowl and mix after each incorporation until fully mixed. Stir in the chips. Using a large cookie scoop, Place cookies a few inches apart on a cookie sheet lined with a silpat or parchment paper. Bake for approximately 12-14 minutes making sure not to over bake. (I take them out at EXACTLY 13 minutes. Even if they look too soft, remove them from the oven! They will set as they sit on the baking sheet) Allow to cool for a few minutes on the cookie sheet to set before removing them to a cooling rack. Let fully cool before frosting them. Place the soft butter in a medium mixing bowl and, using the whip attachment, whip the butter for 3 to five minutes. ( The more you whip the butter, the fluffier your frosting will be). Puree several strawberries (with stems removed) in a food processor or chop them fine. Add vanilla and pureed strawberries in the mixing bowl and whip with the butter till mixed. Add powdered sugar 1 cup at a time and whip the mixture after each incorporation. After the 4th cup is added, make a decision regarding the frosting texture and consistency and decide if another cup is needed. Spread fresh frosting on fully cooled cookies. Store in a covered container in the refrigerator up to a couple of days. I want to say hello to a few of these beautiful cookies! Did you make these just for me, Renee? 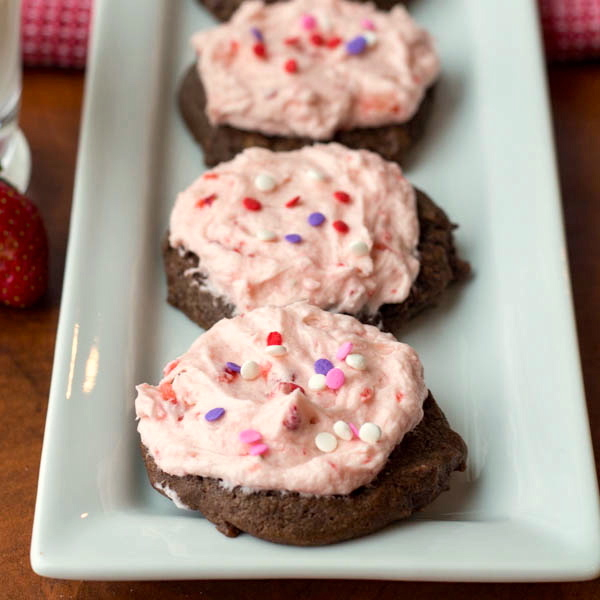 Because chocolate and strawberry is my favorite combination ever and these cookies look amazing! Pinning so I can make these soon! Truer words were never spoken –> “…strawberry buttercream frosting! Oh my heavens! !” 🙂 And REAL strawberries in the frosting??? I can taste that from here! YUM!!! They look fantastic! And, I know what you mean by the pink thing…but sometimes, you’re just in the mood – ya know? The pink girlie thing just hits ya. Bam! Thanks Consuelo: We are definitely on the same vibe with this “pink” thing!! 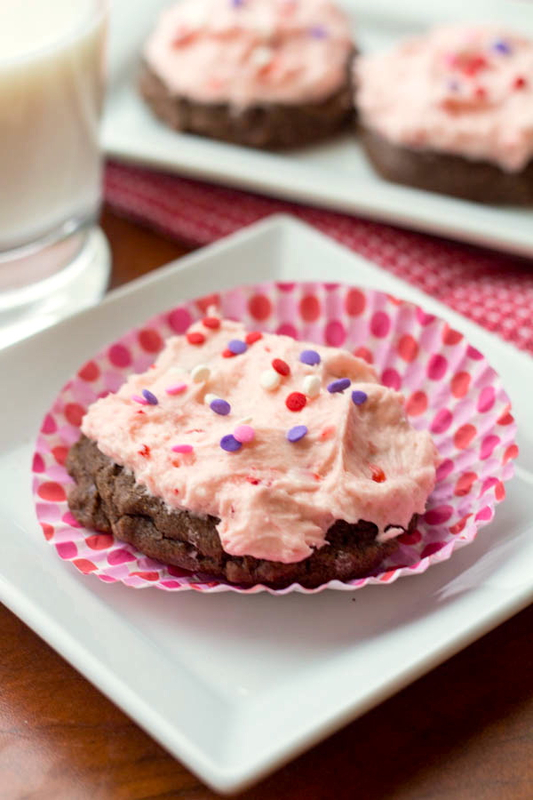 I’m all about the brownie-ness with these gorgeous pink treat! I love the bits of strawberry in frosting, Renee. Chocolate and strawberries are the perfect Vday dessert. Pinned! Oh I love these! I made a similar frosting last year with real strawberries and it was seriously the best. I bet it is delicious with these brownie cookies! A perfect pairing for valentine’s day! Oh, did you?? I’m going to have to check yours out!! I now think that strawberry frosting is my favorite. I can’t wait to slather it on a big strawberry cake this spring!! ooooooo chocolate and strawberries scream Valentine’s Day! Oh wow!! These look amazing! Perfect for Valentines day!! Cookies w. frosting… what a great combo!! Thanks Cailee! I like frosting on pretty much anything!! Oh yes Trish!! 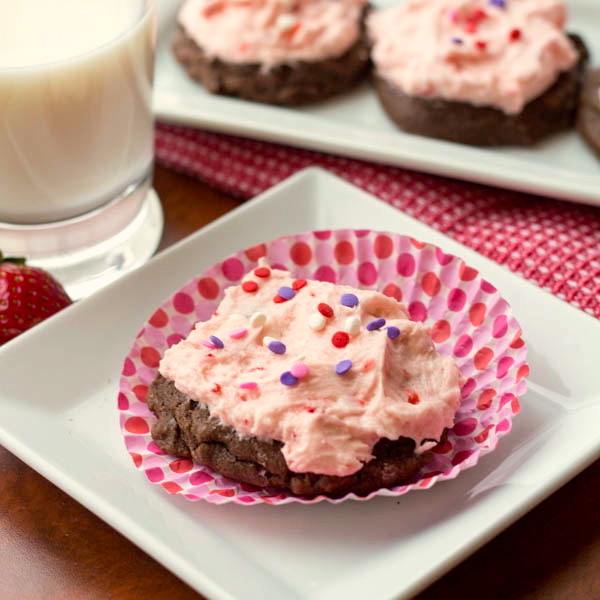 These do taste like a chocolate covered strawberry: with frosting= even better!!! Thanks so much for the pin!! These are perfect for Valentines Day!! 🙂 Delicious and pretty!! Thank you Jocelyn! That sums up V-Day for me: Delicious and pretty! I love it! I’m not a pink kind of girl either, but pink is definitely a necessity for Valentine’s day goodies. 🙂 These bars look so pretty and delicious! Thank you Tina! And I agree, pink for V-Day is a must!! I just made these cookies today and they turned out fabulous! Thanks so much for the recipe. I did have to add extra flour, but that is likely due to the high altitude here. 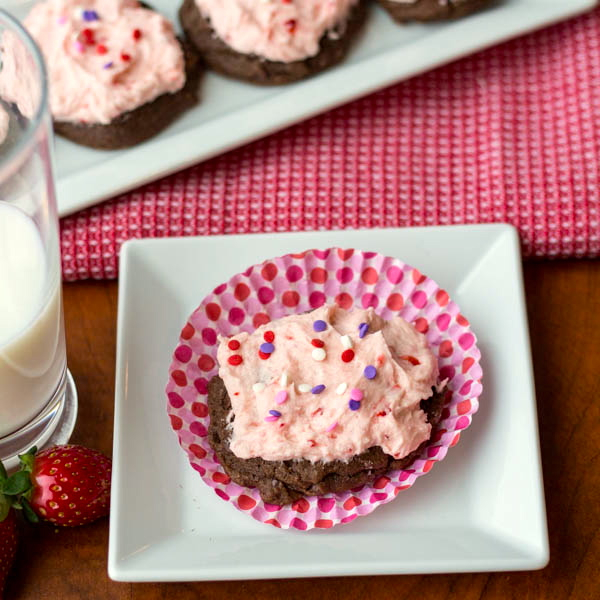 You can’t go wrong with chocolatey, rich cookies and fresh strawberry buttercream. Oh I’m so glad you enjoyed them Nina! I really don’t know anything about high altitude baking….so you have to add more flour huh? Interesting and good to know!! Strawberry buttercream sounds incredible! I might have to spread it on every baked good from now on!